Raymarine’s Evolution R4 Autopilot system is going around-the-world in the most grueling sailing race of all – the 2016-2017 Vendée Globe. Japanese skipper Kojiro Shiraishi chose Evolution to steer his boat Spirit of Yukoh for this edition of the legendary round-the-world, non-stop, single-handed race. 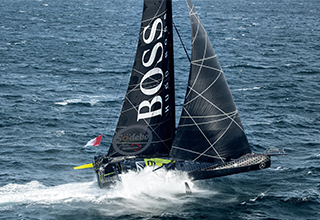 On Sunday 6th November, Alex Thomson commenced his challenge to become the first British skipper to win the Vendée Globe onboard Hugo Boss. The Vendée Globe is a round-the-world single-handed yacht race, sailed non-stop and without assistance.